Time for bed? Time for poetry! Former Children's Poet Laureate Kenn Nesbitt presents a blockbuster collection of brief, original gems by the most beloved writers and poets of our time. Illuminated with dreamlike wit and whimsy by New York Times illustrator and award-winning artist Christoph Niemann, here is a new bedtime classic. Containing more than 140 original contributions, including all-new poems from Jack Prelutsky, Jon Scieszka, Dennis Lee, Sharon Creech, Nancy Willard, Mary Ann Hoberman, Nikki Grimes, Judith Viorst, Lemony Snicket, Lee Bennet Hopkins, Naomi Shihab Nye, X. J. Kennedy, Jane Yolen, and many more, bedtime just got easier. When it's time for tuck-in, and your little one wants just one more moment with you, fill it with something that will feed the imagination and fuel a love of reading. 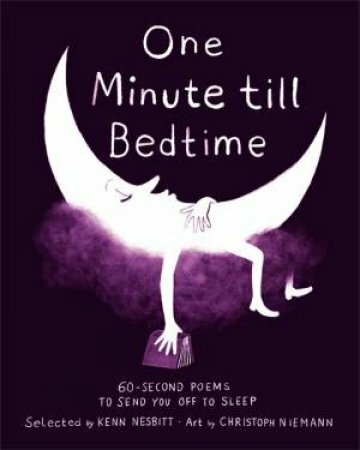 Share a one-minute poem!